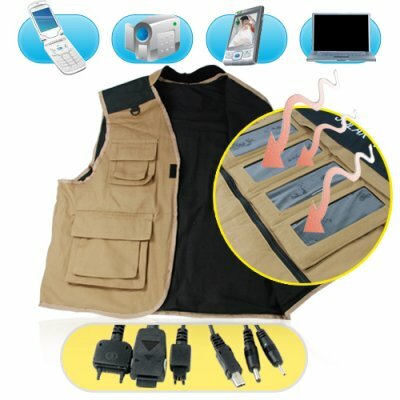 Successfully Added Solar Vest - Solar Battery + Charger for Portable Electronics to your Shopping Cart. This Solar Vest is a fusion of fashion and technology that lets you keep your gadgets fully charged when you're working or playing outside. This vest is like a solar power station to keep your cell phone, portable media player, notebook computer, digital camera, and other portable electronics fully powered while you are working outdoors. This "fashion-tech" canvas vest is the perfect field accessory for photographers, archeologists, investigators, geologists, and anyone else constantly working outdoors. The CVFR-S09 Solar Vest is designed for your comfort and convenience. It comes with big storage pockets for holding tools or camera equipment and includes a battery pack + cables and connectors for all of today's popular portable electronics. The vest's canvas is soft but durable and the stitching is second to none. The vest's 4 solar panels are laminated to be truly weatherproof, so you don't have to change this vest just because the weather is bad. You can also detach the solar panels and place them in sunlight while you are working inside a cave or shaded terrain. So how do you use it? Well, just because it's high tech and super hip doesn't mean it's difficult to use. While you walk outside, the four solar panels on the back of the vest absorb solar energy and store it in a high-capacity battery located in the front left pocket. When your cell phone or other gadget needs power, just plug it into the battery and let it charge. Simple as that! The CVFR-S09 is a must have item for the next time you hike, travel cross country, backpack, or go cruising for chicks. This item is in stock and available for single quantity or bulk orders, so grab one for yourself today or purchase five to resell on your internet storefront. From your best source of fashionable, high tech gadgets, Chinavasion. In case your friends think this is only an ultra-fashionable vest, the words "SOLAR VEST" in big stitched lettering on the back let them know this is really a high-tech solar battery. The voltage of my laptop battery is different than the voltage of my laptop. Will the CVFR-S09 still be able to charge my laptop battery? Yes. The solar battery comes with a 12-20V power output for laptops and notebooks. If your battery or laptop in within this voltage range then you should have no problem charging your laptop battery or using the laptop without a battery. Why can I not charge my laptop when the solar battery displays a red light? The power station reserves some power for devices requiring lesser voltage, such as cell phones, and MP3 and MP4 players, which require less than 9 volts. To use your laptop with the portable battery charger, make sure it at least shows the orange light. There are only 7 device connectors, and none of them is compatible with my cellphone. Can I purchase a connector that is compatible with my mobile phone? And will the power station still charge my phone? You may be able to purchase more connectors from third parties, and still use them with the portable power station. Unfortunately, we do not sell connectors separately other that the ones already included in the CVFR-S09, and do not have information regarding where to purchase more media device connectors. Are chicks attracted to this solar vest? Like moths to a light bulb.